SUNBURY – Eight LED lights have been installed in the cupola and spire at First Reformed United Church of Christ in Sunbury. A crane owned by T-Ross Brothers Construction extended nearly 90 feet to the cupola for the installation of the lights. Electrician Bonnie Baylor and employee Corey Long worked from a crane basket to install the lighting. The tip of the cross on top of the spire is about 125 feet above the ground. Crane operator Bill Dangler had to use caution with the crane due to strong winds, but the job was completed successfully. 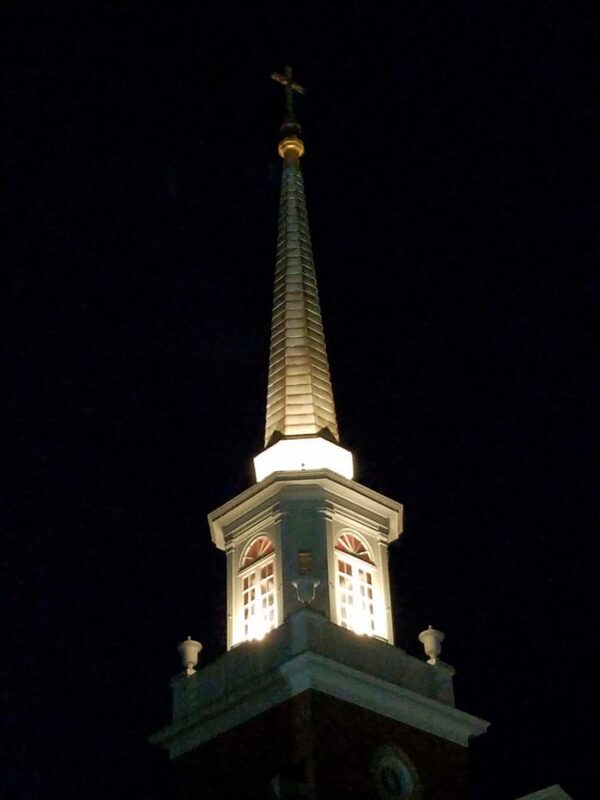 The post New LED lights for cupola and spire at First Reformed United Church of Christ appeared first on T-Ross Brothers Construction, Inc..